This study covers a number of topics that are prominent in the grammars of Australian Aboriginal languages, especially ergativity and manifestations of the hierarchy that runs from the speech-act participants down to inanimates. This hierarchy shows up in case marking, number marking and agreement, advancement and cross-referencing. Chapter 1 provides an overall picture of Australian languages. Chapters 2, 3 and 4 deal with case systems, including voice alternations and other advancements. Chapter 5 deals with the distribution of case marking within the noun phrase. Chapter 6 deals with systems that allow the cross-referencing of bound pronouns. Chapter 7 deals with clauses which appear to have more than one verb. Chapter 8 deals with compound and complex sentences. Chapter 9 deals with word order, and emphasises a theme introduced in Chapter 5, namely the widespread use of discontinuous phrases. Chapter 10 draws together ergativity and various manifestations of the hierarchy, and attempts to interpret their distribution. 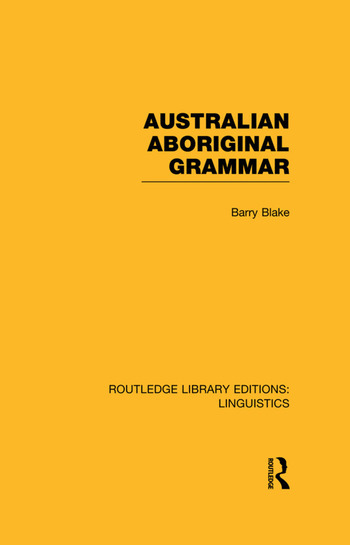 The final section provides an interesting hypothesis about the evolution of core grammar in Australia.